The festival was very nice. There was so much to see I had a hard time trying to get to the temple due to the fact I was so preoccupied with the shops that were all around. I was happy I did not do the fortune because some of my fellow classmates got bad fortunes. I don’t think I got the chance to go all the way through the temple but I enjoyed all that I did see. The festival was indeed very nice. The people were dancing and doing their things. I really appreciated the culture. It was like a festival in downtown Detroit. The music and drumming was awesome and I love the food. They had chocolate covered fruit with loads and loads of ice cream and kabobs. That was a nice experience. It nice that we get to see the temple festival, but that also make it very crowed though so I didn’t get to explore the area as much as I want which is very unfortunate since the area around the temple is very large and fill with interesting shop. but I think it was folded that day because it might interferer with the little shrine they’re carrying around. I also really enjoyed this festival. I never usually trust street vendors when it comes to the safety of their food so I did not try any of the many different edibles, but it was more legitimate than the usual food one can find of the street. One thing I did not really enjoy was seeing some of the older men who decided not to wear pants. I guess this is another aspect of their culture, but most of the people, even the traditionally dressed, were fully clothed. Even though I was pretty ill during the visit to the Asakusa temple it was so beautiful and I was glad I was able to see it all. The wonderful shops and the amazing food along the way to the temple was great! I was able to find some great deals on Kimonos and small souvenirs for my family. I enjoyed watching the parade of children drumming and dancing through the streets. Although the place was overcrowded, I have to say that enjoyed every single aspect of it: the smell of different exotic food which I never had the chance to try, the shouting of the sellers which I seldom comprehended and most importantly the ritual that was taking place. I still recall, when you and I tried our luck at the temple and we received bad omens. You decided to untie it whereas I didn’t. Not superstitious by character, I decided to keep it as a souvenir as it engulfs so many memories I long never to forget! This was one of my most enjoyable site visits. When I first arrived to the site of the temple I was at a lost for words once setting my eyes on the temple. The architecture was amazing. There were people all over this particular area enjoying the beautiful day and the festivals that were going on in the street that seem to me to be a bit random. 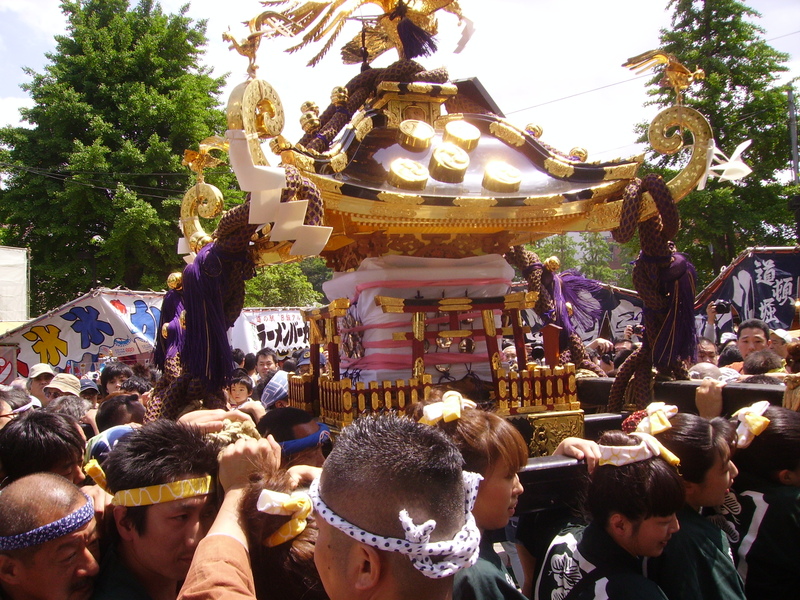 There were men there half naked carrying sometime of shrine that seem to weigh a lot, while chanting something that I was not familar with. I really enjoyed the festival as well, but I didn’t enjoy the crowding! It was so crowded there that at times, I could barely move. Watching the people carrying the relic though was amazing! People of all ages and genders were either working to carry the relic, or following the group and chanting. And their attire was very interesting — a garment that usually went down to their mid-thigh. Some of them wore pants, shorts, or spandex underneath, and some wore absolutely nothing! I was shocked to see some bottoms peaking out!! Like everyone else, I enjoyed the festival here. This was probably one of my favorite places, and even though it was difficult to get through the crowd, I felt it added to the excitement. I wanted to take my time and explore the shops AND the temple, but I had to make the shops take a back seat so I could explore the temple. I was unfortunate enough to receive a bad fortune and I didn’t even realize I could tie it off. But it was all good, I had a great time! I wish I would’ve bought a Katana, but luckily I didn’t. It would’ve left me broke!